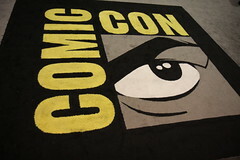 I'm sure everyone who reads this blogs know that Comic Con 2010 is taking place in San Diego, California this weekend. While it is true that I cannot be there, a steady stream of information is coming out from a variety of sources. I'm trying to find everything I can get my hands on. I'm posting a lot of it on my Favorite Media blog in case you might be interested. The following is too good not to share!